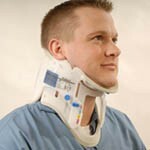 Adjustable Ambu Perfit Extrication Collar. A one piece polyethylene shell design that adjusts to any adult neck size with 16 different settings, ranging from Neck-less to tall sizes. Two safety lock buttons hold collars in place when adjusted. Stores completely flat. Has extra Velcro for thin neck adjustments, a size line for easy accurate adjustments, a large trench hole and a flip chin piece. Pediatric size also available at slightly higher price. Please specify your choice when ordering.